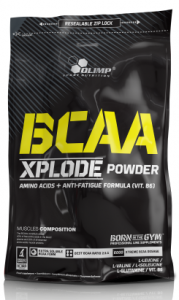 Olimp BCAA Xplode is food supplement of high quality branched chain amino acids (leucine, valine, isoleucine) in proportion of 2:1:1, enriched with L-glutamine and vitamin B6, that contributes to the reduction of tiredness and fatigue. The product is designed especially for active people and sportsmen. 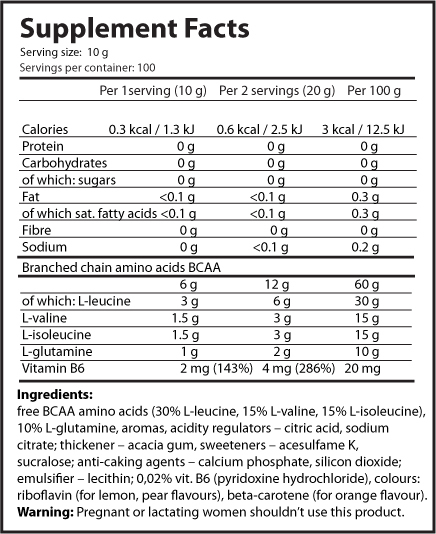 BCAA Xplode Powder Branched chain amino acids (BCAA) complex with vitamin B6 in powder – food supplement especially for sports people. With sweeteners. Take 1-2 portions of OLIMP BCAA XPLODE a day - before a meal or training and after training or before sleep. Add 1 portion (10 g of powder - 25 measuring units of the Olimp scoop or 2 flat tablespoons) to 200 ml of water.